Rocket Matter are a US based online legal billing and law practice software management company. 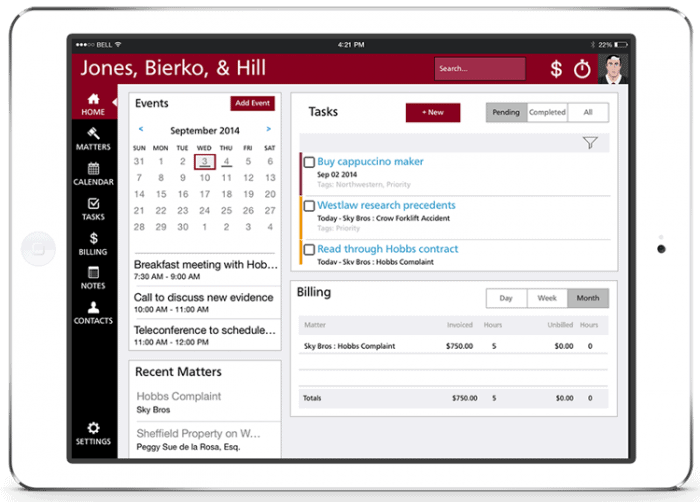 They were the first online legal billing system in February 2008 and immediately, the intuitive elegance of the software and the fast performance attracted Mac-using attorneys, and the number of lawyers using Rocket Matter’s law practice management software on Macs, iPhones and iPads grows daily. PC users quickly joined Rocket Matter as well, and now they have a happy community of both Mac and PC-using attorneys. Rocket Matter already has a strong, highly skilled agile software development team based in house in Florida, USA, but due to their overwhelming success of their existing products, Rocket Matter were looking to find some external resource to help them with the first phase of their ground-breaking new Rocket Matter iPad Edition. This project involved McKenna Consultants building a close working relationship with the Rocket Matter team by developing the first phase of the uniquely stunning and intuitive Rocket Matter iPad Edition. Rocket Matter currently have thousands of attorneys throughout America using their software across a range of devices. They have a dedicated software development team who is committed to maintaining and improving these existing platforms. From speaking to their customers, Rocket Matter knew that they needed to develop an intuitive, slick, responsive dedicated iPad edition to fit inside their product catalogue. However, due to their success, development resources were limited. Rocket Matter approached McKenna Consultants to help deliver this iPad edition due to our technical expertise (we’ve built numerous native iOS apps), reputation and our ability to deliver a successful project on time, to a budget and in an Agile manner. In addition to this, as mentioned previously Rocket Matter are based in Florida, USA and McKenna Consultants are based in Harrogate, UK. There is a 5 hour time difference between the two offices that the combined development team are working in. This would be a huge obstacle for some development companies, but due to the high communication and agile working environment, this did not pose a challenge to either company. We worked hand in hand with the Development team at Rocket Matter to ensure the successful delivery of the Rocket Matter iPad Edition. Once we handed the app back over, we have remained in touch and on call for if and when the Rocket Matter team require any further assistance. Rocket Matter have then gone on to successfully finish the iPad Edition and will deploy it to the Apple AppStore, ready to be downloaded and loved by their customers. Without our strong project management techniques, learned out of years of tweaking and adapting our agile process, we would not have been able to deliver this project so successfully. We work tirelessly to maintain or team values whilst working with a team not in the same country. We also came up with new ways to monitor and track our progress when working to a set budget – a process that we have gone on to implement for our other projects. The Rocket Matter iPad Edition is available to download on the AppStore and you can take a look at the app in more detail by visiting the Rocket Matter dedicated iPad edition website.